Adorable story about a stork named Stilts who is eager to have a family. She finds her first 'egg' on a golf course, builds a nest and waits. She continues to find more and more 'eggs' as the days go by. Content to sit on her nest and wait for her eggs to hatch! Stilts is a funny bird in high heeled shoes and determination. 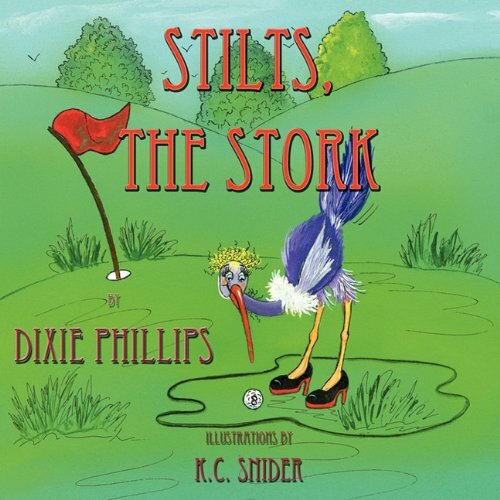 Dixie Phillips uses smooth flowing rhymes to tell the story and make you laugh. Great illustrations of this leggy bird and her new found family. I was left wishing for more and felt the conclusion was a bit abrupt, surprised when I turned the page and it was the end. I guess the Mama in me wanted Stilts to get her real family ! Thanks to Dixie Phillips for a review copy of this book, it was a pleasure to read to my children! I was telling my kids today how much I miss reading picture books. The cover makes me smile.